First appearing in The Force Awakens, the quadjumper arrives to X-Wing™ as a Scum and Villainy ship, full of new manoeuvres and dirty tricks. Because the quadjumper in The Force Awakens was destroyed while it was landed in the Niima Outpost spaceport, we never got to see this ship in action. Nonetheless, its precise tractor beam array and unique manoeuvrability make it a versatile favourite among traders and smugglers in the Outer Rim. In addition to its pre-painted quadjumper miniature, the Quadjumper Expansion Pack allows you to militarise this typically unarmed ship with four Scum pilots and eight upgrades. These include new crew members, illicit technologies, and a modification that grants extra versatility to your tractor beam tokens. 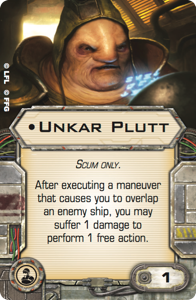 These include a crew version of blobfish Unkar Plutt, as well as a unique elite pilot talent and associated condition that help your elite pilots pay back their debts against those who have done them wrong.